Many years ago at a classroom management training I brought away this self regulation idea for students who have difficulty with managing their behaviors. You involve the student in identifying what behaviors they display when they are calm, BUGGED, and their personal signals of stress. Then you work together to plan "Short Cut" choices to avoid a "meltdown". This sample is one I used a few years ago. 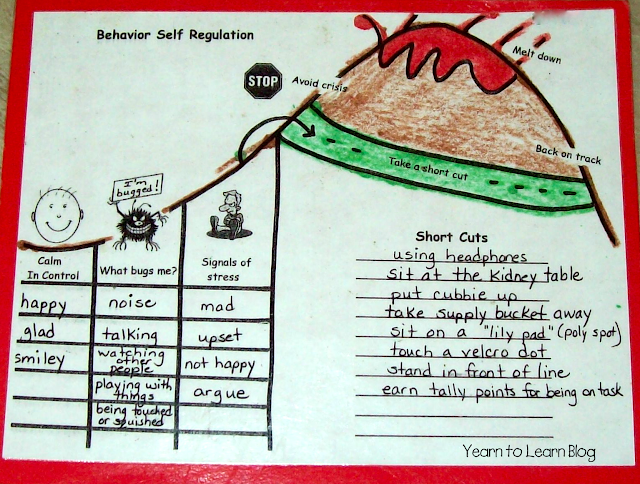 I simply attached the visual to the student's desk as a constant reminder for self monitoring. This is really a smart little reminder for those kiddos who tend to have meltdowns. I am VERY thankful I haven't had one of those in a few years. Oh! Do you have a copy of this somewhere!!!?? This is perfect to go with a post I just wrote for later this week and for one of my kiddos. I am so glad that I found your blog. I really like your design and your ideas. I love the behavior volcano and plan to use it! I would love for you to stop by my new blog. I am always looking for suggestions. Yes Can you put up or email a copy? I would also love a copy of this to use with my kiddos. ahorton@duxbury.k12.ma.us Thank you!!! Cool idea! Please add me to the list of those wanting a copy. Thank you. Hi, I would love a copy as well! I would love a copy of this too. this is great! mommymjen@yahoo.com thanks. This is amazing and I have students who could really benefit using it. Can you please send me a copy dayna61414@gmail.com. Thank You! Could you please send me a copy? jarv3136@isd194.org Thanks! Could you send me a copy as well? Hi there, love this! Anyway I could get a copy? I love this idea as well. May I have a blank copy? I would also love a copy of this! sadavis@vcsb.org. Thanks! I too would love a copy! It is sooo helpful! jrile82@gmail.com Thank you! May I please have a copy to use with our students? I would love a copy. Thanks! Fantastic! May I request a blank copy as well? May I too have a copy of this tool. This is a great tool I can use in therapy sessions! danielle.miner.lpc@gmail.com Thank you!! Thank you so much! My SPED emotional disturbance kiddos will greatly benefit from this. Hi. I would love to use this activity. Can you please email me a copy at Turtlesheaven@gmail.com? Thank you! HI There! I would love a blank copy as well to use with my students! Thank you! This looks exactly like my work that I did for a class. Hi there! I am a counselor and I would love to use this worksheet with a younger client. My email address is robin@cantoncounseling.com. Thanks so much! I am a behaviour therapist in Bermuda and would love a copy of this worksheet. I tried your TPT page and was unable to find it. I would be very grateful if you could send me one. Lmorbey@moed.bm Thank you in advance for any help you can provide! Do you still have this available? I would love a copy. ivyelynn@gmail.com. I looked on your TPT page. Hi, you're probably sick of people asking you for a copy...I'm a therapist working with children with severe impulse control issues and this is one of the best things I've seen (easy, interesting and engaging). Did you draw it yourself. Would you mind if I make my own with your general idea? I really appreciate anything you can do to assist. Thanks! I would also love a copy! jbachman@clintonville.k12.wi.us please with a cherry on top?